Black mustard seeds : 1 tsp. Yellow mustard seeds :1 tsp. Soak Split peas overnight or 3-4 hrs in warm water, drain and grind them with 2 green chillies, salt, sugar, ginger paste. Whip for 7-10 minutes by hand and for 2 minutes in a blender. Boil the potatoes. Heat one cup mustard oil to smoking in a karai, reduce heat and drop level tablespoonfuls of the batter into it carefully so that they form into balls (boras). As they fry to a golden brown and come to the top of the oil, Keep aside. In the same karai, add mustard seeds, when seeds are splutter then add onion, fry until golden brown. Then add tomato, saute for 2-3 mins. After that add mustard paste, turmeric powder, red chilli powder, salt and sugar, mix well. 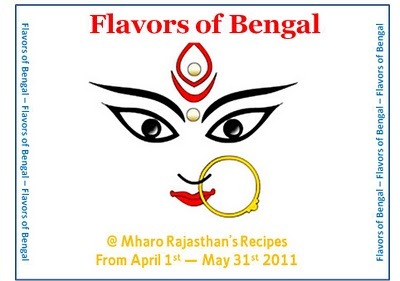 Now add boras and boiled potatoes, mix well with masala. Then add 1 cup of water, cover and cook for 5 mins. It is dry based gravy, Borar jhal is ready to serve. 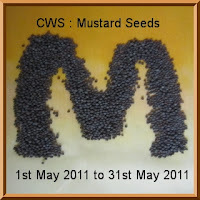 Sending recipe to Kiran's "Cooking With Seeds Event(CWS) : Mustard Seeds"
Sending this recipe to Priya's "Flavors of Bengal"